Tom Reilly idolized his older brother, Ron. After their parents' unexpected early deaths, Ron protected his younger brother and taught him the ways of the world. Ron was a charismatic and worldly career soldier, and his kid brother thought of him as a mentor and hero. In July 1970, Ron died halfway around the world in Vietnam. Unfortunately, due to sales rights restrictions, we cannot offer Next Of Kin for sale in your country. Tom Reilly idolized his older brother, Ron. After their parents' unexpected early deaths, Ron protected his younger brother and taught him the ways of the world. Ron was a charismatic and worldly career soldier, and his kid brother thought of him as a mentor and hero. In July 1970, Ron died halfway around the world in Vietnam. When the Army provided no explanation except that Ron's death was not due to combat, the nineteen-year-old author set off on an incredible journey to war-torn South Vietnam to find answers, to seek revenge if necessary, and to come to terms with his loss. Next of Kin begins in small-town Wisconsin, where Tom's peaceful childhood is shattered by the deaths of his parents. Later, Tom makes it on his own as a runaway, has unforgettable adventures with his brother in a seedy Mexican border town, and is nearly paralyzed with grief when he learns of Ron's death. On his singular journey to Southeast Asia, Tom evades the police in Bangkok, is smuggled across the enemy-controlled Ho Chi Minh Trail into South Vietnam, fends for himself in Saigon, and survives a mortar attack and a bout with malaria all to find out the truth about his brother's death. 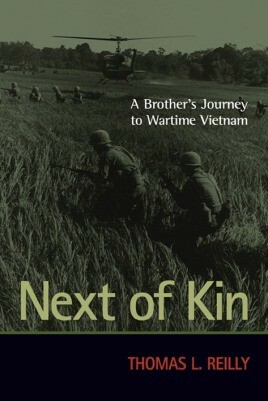 Next of Kin is a touching story of sibling love and family tragedy that will appeal even to those without any connection to the Vietnam War.